High viscosity foam systems represent a major challenge to design correctly. 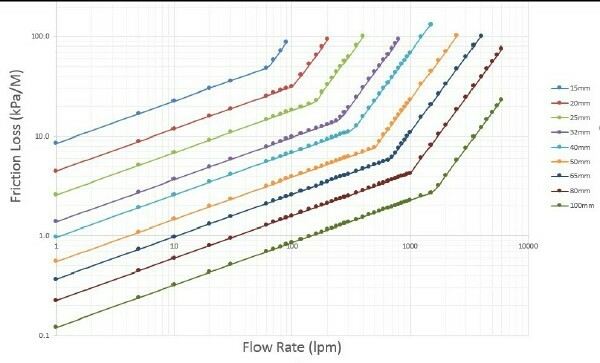 Each concentrate has different flow characteristics and often the data needed to calculate friction losses is not available. Losses in fittings are also not well understood. Below are the friction loss charts for two different foam concentrates and this illustrates the large differences that are possible between products. The friction losses per meter are very different. The first product is sufficiently different that care would need to be taken if it is to be used as a replacement for the second product or for standard AFFF. Suction piping would need to be checked and proportioner metering orifices would need to be changed. To generate these charts we need shear rate vs viscosity data for the concentrate and that is often not available from the manufacturer. NOTE: This data is temperature dependent. The charts are generated using the method of Dlugogorski et al, see reference below. 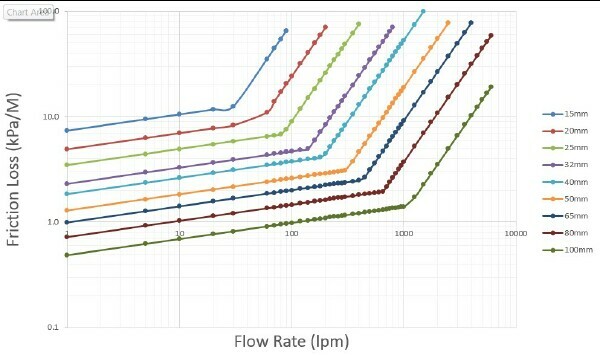 The second problem is working out losses in fittings and valves. It is quite common for people to use the equivalent length of pipe for a fitting or valve when designing foam concentrate piping. This is incorrect. The equivalent length concept really only works for water or other relatively low viscosity fluids. It produces very large errors for high viscosity concentrates. Fortunately for most system designs this over estimates the friction losses. There are instances where more accurate calculations are required, such as pump suction piping. The losses is valves and fittings can be better calculated using the formula Loss = K x (velocity ^2)/2. Where the K values are the same ones used for water for fittings, see here… This may still slightly over estimate losses. Losses will be different for each concentrate. We have done limited testing of pipe elbow losses that confirm this point. Orion has considerable of experience in this field.